View from Front of House. 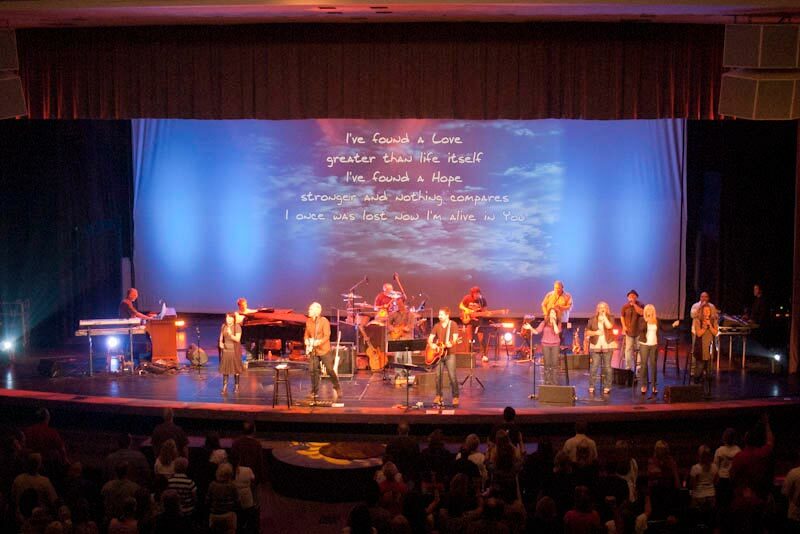 That's Kevin Sanchez capably manning Monitor world on stage left.This week we held a Night of Worship at Coast Hills. To say it was a big event would be an understatement. One could argue (and someone did point out) that we probably made it more of a production than it needed to be, but hey, that's part of the fun. We had a big band to start with, a bunch of vocals, our two worship leaders plus a guest leader, so we thought it would be fun to throw some new technology into the mix. 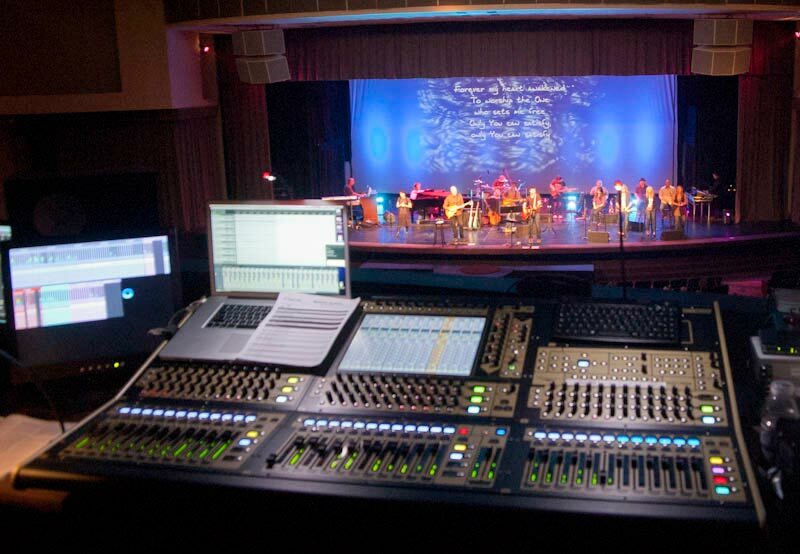 Rather than use our M7 for monitors, we asked Digico of we could borrow a second SD-8 to mix monitors from. 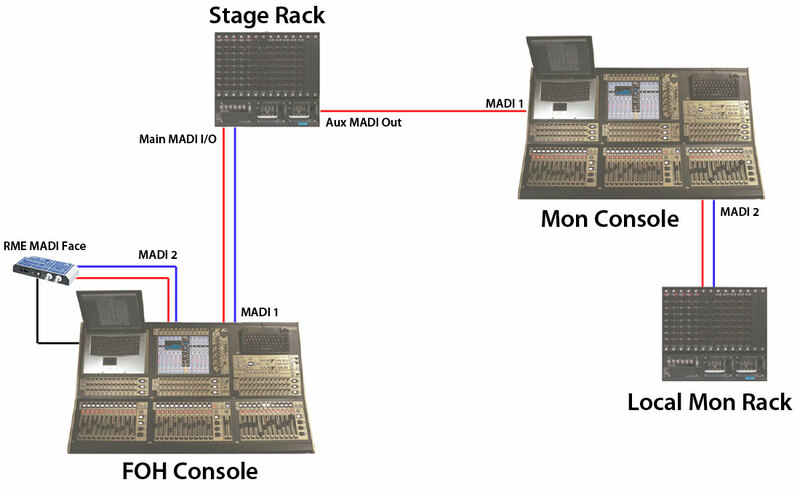 We shared our DigiRack for inputs, using gain tracking to keep levels under control, and drove all 14 monitor outputs from a MADIRack connected to the monitor SD-8. We also multi-tracked the entire evening using a RME MADIFace at FOH. That sounds like a mouthful now that I've written it, so let me break it down. The stage rack was under complete control by the FOH console. It is connected via two 75 Ohm coaxial MADI cables; these cables provide 56 channels (in & out) plus control. At FOH, I used the Copy to MADI 2 option to duplicate the inputs right over to the RME MADIFace that is connected to the 17" MacBook Pro running Reaper for multi-track recording. This takes every channel from the stage rack directly to the Mac immediately after the pre-amp. By pressing "Listen to Copied Audio" (after correctly setting up the routing in Reaper), each channel comes back into the console as if the band were still on stage. The stage rack (a DIGIRack in our case) has both a main and aux MADI input/output. We connected the Aux Out to the monitor console's MADI 1 input. This brought all the stage inputs into the monitor console. We engaged gain tracking so that any changes to the pre-amp gain stage made at FOH would be compensated for with the digital trim on the monitor console. Digital trim provides ±40 dB of gain, so there's a lot of room for adjustment. Gain tracking worked pretty well overall, although my monitor engineer reported having to make some tweaks to the gain staging a few times, even with tracking on. We didn't have time to really dig in, test it and get to the bottom of it, so I can't say for certain if there are some minor issues, or if we needed to change our workflow. For our purposes it worked well enough; if I was considering doing this every week, I would test it more before committing. Since we needed more than the 8 analog outputs provided for on the monitor SD-8 surface, we added a second local MADIRack using the MADI 2 I/O. The MADIRack was under complete control of the monitor surface. We simply routed the 6 wedge and 4 stereo ears mixes out the 16 outputs provided on the MADIRack. I spent a fair amount of time in the offline software building the show for FOH. When it came time to load the show into monitor world, it went pretty seamlessly. The only issue we had was that I had selected Copy to MADI 2 in my FOH show, and we forgot to uncheck that option at monitors, which caused a few issues until it was discovered by Taidus Vallandi, Group One's (DIGiCo's US Distributor) intrepid Tech Guru who stopped by to pay a visit. Next time we'll know better. Otherwise, we had to do some re-configuring of the surface to make it work better for monitors, do a little patching and we were good to go. Our local Shure rep was kind enough to drop off a second PSM900 for our guest worship leader, and our monitor engineer Kevin Sanchez brought down a few G3 ears for our other worship leader. After a bit of a rocky start, things went pretty smoothly. There was a little bit of a learning curve to the set up, but given that we started soundcheck at 2:15, the service at 6:30, and we had time to run every song, I call the test a success. At FOH, I snapshotted every song, which was a Godsend given how many changes I made during each one. After playing with the snapshot capabilities for a while, I've figured out how to create a template for a service in advance, then update the snapshots as we go. Again, that worked nearly flawlessly, with only a few minor issues with crossfade times. We now have 11 songs on the hard drive, multi-tracked and ready to go for training, refining mixes, experimenting with effects or tuning the room. This is perhaps the feature I'm most excited about with respect to the SD-8. Honing the craft of mixing only comes with a lot of time and it will be great to go spend an hour or two during the week playing with stuff without having to tie up the band. At the end of the night, we heard many comments about how powerful the worship was. This was a first for us, but I doubt it will be the last. Though it was a lot of work, it was a lot of fun.We created an environment where people could worship freely and that they did.